Manager inventor Peter Arndt demonstrating the popular dry-process otjitoilet. This dry sanitation system does not require a connection to a central sewerage reticulation network leading to the faster development of informal settlements. An important agreement signed recently between the Clay House Project (CHP) and Young Africa Namibia will lead to more training opportunities in technical subjects for the residents of Orwetoveni in Otjiwarongo. The expanded training include trades like solar technician, construction, maintenance and dress making. The first intake is scheduled for January 2015. 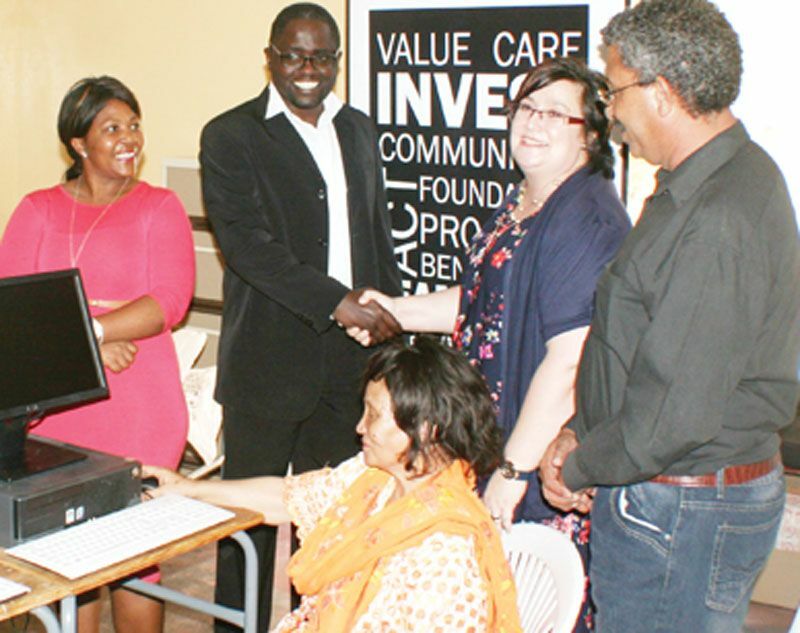 Young Africa Namibia will facilitate apprenticeships for young people by renting out fully-equipped workshops to experienced and skilled artisans who do not have their own premises. The well-known Clay House Project compound in Orwetoveni will be transformed into a multi-trade workshop campus dedicated to offering young people relevant apprenticeships. On 11 December, CHP celebrated its 23rd anniversary. Its original purpose was and is to research, develop and train artisans in various techniques that are necessary to construct and maintain houses and residential facilities that are ecologically, economically and socially sound and sustainable, using local materials. After the first two years of training masons and assistants, the Clay House Project expanded it activities by helping self-builders in Orwetoveni or offering subsidized houses with the help of donor money. The clay vaults and domes proofed to be too risky in the high rainfall years and the organization Grupo Sofonias brought the technology of micro concrete roofing tiles that can be produced on site. Grupo Sofonias through its CHP manager Peter Arndt, reduced the cost of nearly everything, while taking care not to compromise the quality of the houses for low-income families. After some years it was difficult to obtain enough erven to start building, even in the informal settlements. The reticulation of sewage lines takes long and is expensive. To address this delay, Arndt developed a dry sanitation system that allows for quicker development of residential suburbs. The CHP also took over the role of servicing these toilets for the municipality. 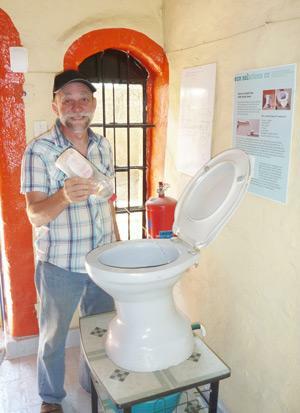 With more and more hands-on experience and feedback from users, the design was refined and the Urine Diversion toilet pot was developed and produced in Otjiwarongo, using local materials and skilled labour. Only the steel for the toilet shelter had to be imported.The training of young adults will now be taken over by the Young Africa Namibia Trust as it is Arndt’s intention to retire from the Otjitoilet production. The CHP facilities are leased to Young Africa to develop an innovative model of vocational training through apprenticeships. The first intake of apprentice solar technicians in January 2015 is based on the successful training offered by Young Africa in Walvis Bay. All apprentices, from all the various workshops and trades have to attend life skills training offered by Young Africa to help them when applying for jobs or starting their own business. These include communication, applied maths, HIV/Aids awareness, decision making and other skills. Does long distance education work?